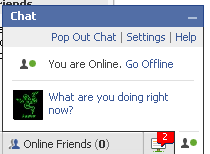 The Facebook Chat that was announced by facebook some time back has been rolled out to every Facebook user today. 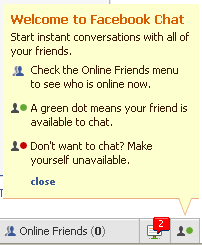 After it was announced about Facebook Chat on 6th April 2008, there was a lot of speculation when will the chat feature rolled out to every one out there. Initially launched to only a few users the feature was finally launched to each and everyone today. As is quite visible what they have done is just a one to one chat feature with just online and offline modes being available. "Conversations are one-to-one, completely private, and only between Facebook friends. The message history is saved from page to page, and even between login sessions, but it is not logged permanently." So now no more scribbling on the wall, just pure chat is the way to go. They really provide awesome facility. sometime we playing farm ville and talking with each other so i can enjoy both fun.